According to Eleutherotypia newspaper, the “Ministry of Citizen Protection”, taking advantage of the new coalition government in Greece, where members of the far-right LAOS party participate, is planning to create two gigantic detention centers for immigrants in Athens. The two new detention centers “should be in the area of Attikovoiotia (close to Athens) with a capacity of about 5-6 thousand people, to offer real relief to the capital city”. LAOS also demands the withdrawal of the citizenship bill, voted 1,5 years ago. Meanwhile, racist attacks are on the rise again. Last Saturday, in Mylopotamos in Crete, 3 immigrants from Pakistan were beaten up in their own home and a car owned by another immigrant was set on fire. In Athens, two Kurds from Iraq were beaten up by 15 policemen while held in custody, awaiting their trial. They were brought back to the prison, where a prison warden, realizing how badly they had been beaten up, ordered their transfer to the prison’s hospital. Last Tuesday (July 19th) unknown arsonists tried twice within a few hours to burn an abandoned house used by immigrants in Kalamata. The first attempt at night caused minimal damage to the building. They returned four hours later and tried to burn the immigrants alive. The immigrants managed to flee the burning building. Their clothes, a television and other objects they have been using, as well as the interior of the house have been destroyed. 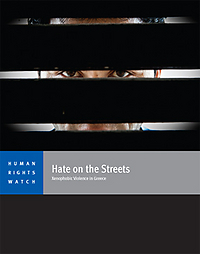 source: http://athens.indymedia.org/front.php3?lang=el&article_id=1146452, thanx to Ben for his help with this post. 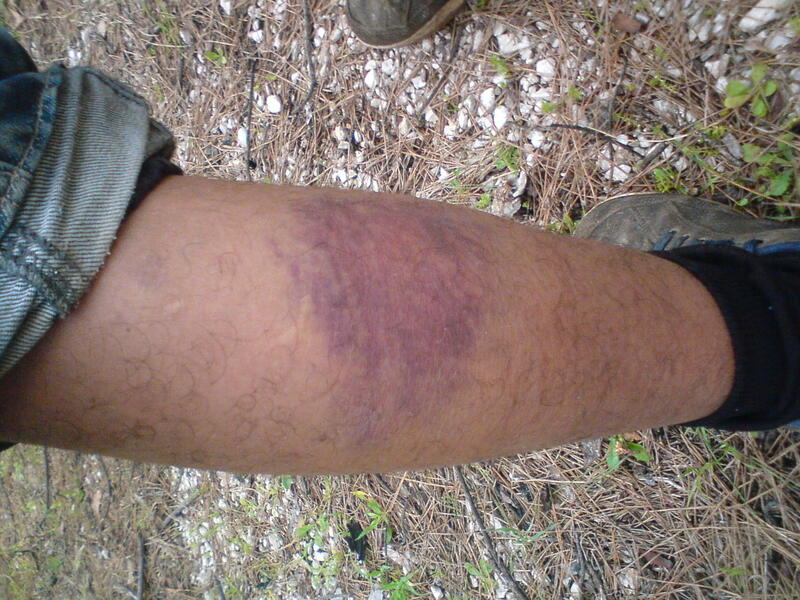 On March 10, Igoumenitsa port police beat an innocent immigrant with their clubs in the port area of Igoumenitsa. The man sustained serious injuries in the attack. This followed a similar incident where police harassed two men seeking assistance at a local health centre. The men were tormented and pushed around by the policemen who informed them that they could not use the services at the health centre and that it was “not a health centre for them”. The small town of Igoumenitsa has been known in the past for its racially motivated attacks on immigrants. One such attack occurred on an immigrant with severe health problems who was unable to defend himself when police set their dogs on the man (Police brutality once more in Igoumenitsa: Cops let loose their dog against immigrant). The attacks continue, and as recently as last Wednesday, when an immigrant disembarked a ferry from Italy and was met by waiting port policemen. It is alleged the man had been beaten by both the Italian police and security thugs aboard the ferry, before being handed over to the Greek police for further punishment. His injuries were so severe that his internal organs had been seriously damaged by the repeated beatings. The situation in Igoumenitsa is out of control with local police using racially motivated violence in a display of abuse against these people’s basic human rights. The Igoumenitsa police continue to raid the immigrant settlement near Ladochori and on March 4 violently attacked six immigrants and left them with serious injuries. Igoumenitsa may be an isolated provincial town and the local police may believe their crimes will remain unknown, but they are wrong. Those people in solidarity with immigrants from Western Greece now monitor the situation and speak out against the abuse of innocent people. As the protests on March 2 have shown, nothing will remain in darkness. the Nigerian community in Thessaloniki is in ferment after the death of a 38 year old fellow Nigerian immigrant who was hit by a car and died helpless on the pavement. The 38 year old Victor Entokpai lost his life while going to work in the industrial area of Sindos at dawn last Friday and his compatriots, friends and relatives, denounce police’s inaction and racist behavior. 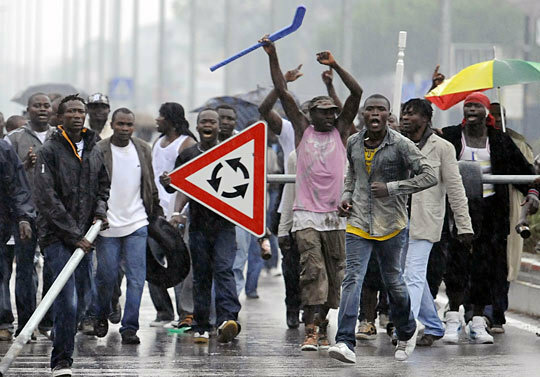 “If we hadn’t been Nigerian immigrants, the police would have reacted more quickly. Now I think that they are indifferent ” said his widow Sandra, Sandra, who arrived at the Thessaloniki courthouse holding in her hands her three minor children. “All I want is to find and punish the driver who dragged and left my husband,” she said. Along with 40 other community members went to court not only to protest for Viktor’s death, but also to show their solidarity to another community member who allegedly beat a police officer during an stop-and-search. Brought against the prosecution for “mere bodily injury”, “contempt and resistance. Referred to the flagrant Three-Member Criminal Court where requested and obtained a postponement. Five immigrants were killed by cops and coast guards during last year in Greece. More than fifty humans have been killed the last ten years because of “luckily gun-fires”, “unclear situations”, “health problems”, “unreasonable self-suicides”, the “reasonable rage of citizens”. In this list there are no cases of deaths that were caused because of inexistent safety measures in workplaces (13 dead immigrants ONLY during the olympic games’ constructions. On this list the deaths because of land-mines at Evros river, or shipwrecks in the Aegean sea are not included, as well as the cases of gun-fire exchange, which were filed as’ “legal self-defense” cases although its certain they were plain murders. In this list there are only cases of straight murders. 9/10/2009:Death of Mohamed Kamran Atif, who was beated up after 15 cops entered a pakistan workers’ poor house on 26th of September at Nikaia district in Athens. 27/7/2009: Death of Kurd immigrant Arivan Osman Abdulah, who was hospitalized in comma, after being beated up by coast guards at Igoumenitsa’s harbour on 3rd April 2009. 23/3/2009: Death of 24 year old Mazir, who was found in comma, on 6th December, in the stream of Votanikos, 600 meters away from the cops’ Immigrants’ Authority Offices at Petrou Ralli St. and was hospitalized in comma. 3/1/2009: Husein Zahidul, immigrand from Bagladesh loses his life in the same stream of Petrou Ralli St.
22/2/2008: Abdukarim Yahya Idris from Sudan gets beated up and murdered by three cops. 8/11/2007: Ilmi Lates, 45 years old and father of five children, was found by border guards close to Levaia village, the guards fire on his back from close distance and falls dead on the ground. 8/11/2007: Imprissoned Pakistan in farm jail of Kassandra was found hung in his cell. The courts have decided to send him back to his country. 11/10/2007: Afgan prisoner, 27 years old, was found hunged in his cell in Korydallos jailhouse. 18/8/2007: Tony Onuoha, 25 years old from Nigeria gets killed in Kalamaria district, Thessaloniki. 15/4/2007: Leonidas Kaltsas, 20 years old from Albania, hunged in cells of Youngsters Authority in Liosia district. 28/3/2007: Mathiea Domin, 16 years old from Poland, prejailed in Avlona, commits suicide in Korydallos’ psychological hospital. 21/11/2006: A dead immigrand from Makreb in the Omonoia cop office. October 2006: Greek Authorities are blamed for throwing in the sea almost 40 immigrants without papers. Turkish coast guards in Karaburun openseas close to Smyrnee collected 6 corpses and 31 alive of them. 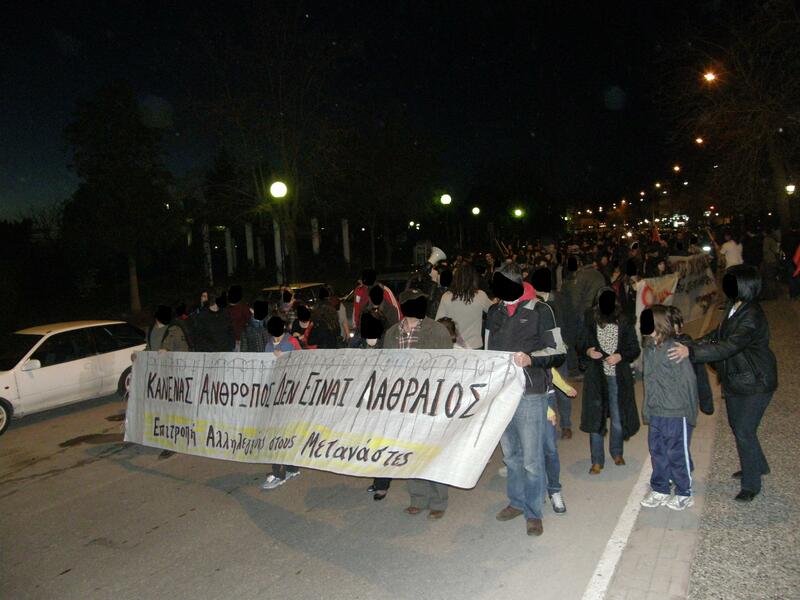 13/2/2006: Patras. A 15 year old Afgan immigrant heavily injured by coast guards and a 29 year old who also presented at the event, fall dead under unclear circumstances. 5/2/2006: Dead, under unclear circumstances, immigrant from Iran at Omonoia cop station. 1/1/2006: Rethymno, Crete. Edisson Yahai killed, 18 years old, killed in his home by a team of greek youngsters (they have earlier a conflict with a group of alban youngsters), with 17 stabs by knife on his head, cheast, back, arms and legs. The victim has not participated in the conflict. 11/4/2005: Lamia city. Dead immigrant from Nigeria in the city’s cop station. The murdered immigrant was buried without a doctor to check the corpe to investigate the reason of death. 4/9/2004: After the match of national teams of Greece and Albania starts a pogrom against the alban immigrants in Athens, Thessaloniki, Larisa, Kilkis, Ileia, Kavala, Zante, Ioannina, Patra, Corfu, Paros, Rethymno, Kalamata, Volos, Rodos… almost all around the greek areas that alban immigrants live there. On Zante island, Gramos Palushi, a 20 years old immigrant, fell dead because of the knife of Panagiotis Kladis. Also two more immigrants in the hospital because of this killer. 13/3/2004: Jandeus Kocheva, 36 years old, dead in the cop station of Vyronas district in Athens. 13/1/2004: Mohamed Hamut, 42 years old from Syria, dead because of “health problems” in cops station of Rethymno, Crete. The doctor who checked the corpe stated that he was beated up all around his body. 23/9/2003: Vulnet Bititsi, 18 years old from Albania shoted and killed by border guards at Krystalopigi. 2/11/2002: Alban immigrant, 32 years old, shoted and killed by border guards at Kastoria. 1/12/2001: Border guards shot against two young albans in a village close to the borders at Thesproteia area, one falls dead. 21/11/2001: Cop Giannis Rizopoulos murders at America Square, Athens an immigrant from Albania, Gentjan Celniku 20 years old. 29/4/2001: Burdaki Taveus, 38 years old from Poland, commited suicide in the cop station of Kos island. He was found hung in his cell, after he was arrested and waiting for months to be sent back to Poland. 1/8/2001: O. Pazil from Turkey gets killed by coast guards around the sea space of Kos island. 4/6/2001: Afrim Salla, 15 years old from Albania, gets shot and loses the ability to move his legs, after -as Greek Police stated- the gun of the border guard fired by luck. 13/2/2001: Konstantin Katur, 47 years old from Romania, dies in a cop station. Despite his heavy injure no cop took him to a hospital. 23/11/2000: Chavahir Katsani, 22 years old from Albania and Ryon, 15 years old from Albania are shoted and killed by a greek at Galatista village at Halkidiki. 1/11/2000: Bledar Qoshku, 20 years old from Albania, was killed -as Greek Police stated- after he and a cop started shoting against each other. The gun that Bledar Qoshku should carry was never found. 10/8/2000: A 20 years old immigrand from Albania gets killed by border guards at Ieropigi, Kastoria. 14/6/2000: Border guards shoot and kill an immigrand at Evros river. 25/7/2000: A 22 years old immigrand gets shot and killed by greek army general at the greek-bulgarian borders. 15/6/2000: Yoval Badjar, 25 years old gets killed by G. Pistolas, a border guard, at Megalo Dereio village at Evros river. 27/4/2000: An under-18 immigrant from Albania gets murdered by cop, with a bullet on his neck, during a revolt at Avlona jailhouse. 25/3/2000: Nikos Leonidis, 17 years old from Georgeen, gets killed by mr. Atmatzidis, an undercover cop, in Thessaliniki. 21 & 23 of October, 1999: P.Kazakos, 23 years old, guard at ERT (governmental TV-channel) starts shooting generaly against immigrants. Victims of him: Kofi Tony from Ghana dead. 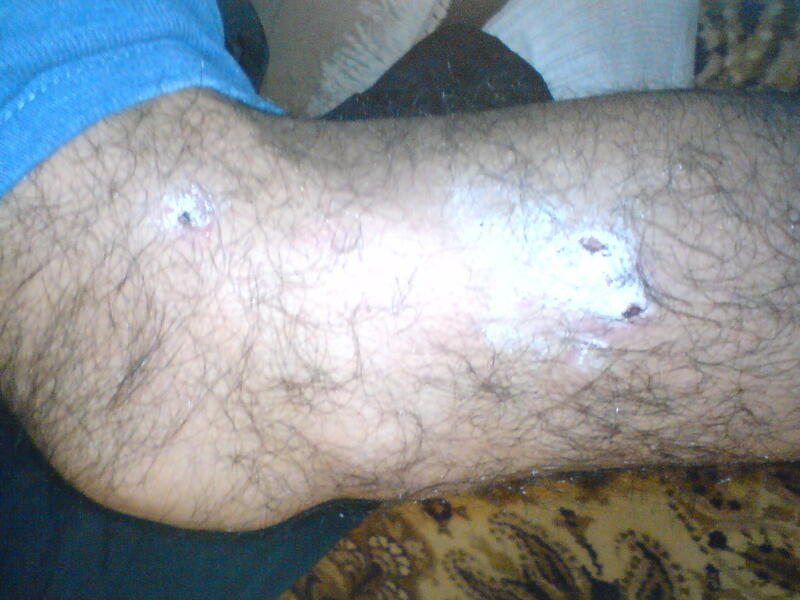 Saad Abdelhadi, 30 years old from Egypt has serious moving problems. Hindir Serif, a 25 years old kurd, loses the ability to move his legs. Kurd Rasul Posef, Ahmed Nasar from Pakistan, Timoty Abdul from Nigeria and Mohamed Datnon from Bagladesh were not so heavily injured. 7/4/1999: An alban woman gets killed by Greek Police at the greek-macedonian borders. 18/3/1999: Lanti Peppa, 20 years old from Albania gets killed in Kastoria by Greek Police. 13/3/1999: Arben Vezi from Albania gets killed at Kozani by cop named Athanasios Kanavas. November 1998: A. Hoxoli, 20 years old from Albania gets killed by A. Gougousis, because the victim tried to steal his horse. After this, the killer tried with some relevants of him to hide the dead body. 23/10/1998: Marco Boulatovic, a 17 year old student gets shoted at his heart in Thessaloniki by cop named Vantoulis because he was a “suspect for stealing”. October 1998: Shbobek Miesic, from Poland, dies in the cop station of Meligalas because cops refused to transfer him to a hospital despite the doctor’s orders. 15/6/1998: At Megara city gets killed a youngster from Albania. 5/6/1998: Bokari Baho, 28 years old, falls dead because of “fear shots” of a border team. April 1998: Ose Ogbuefi, from Nigeria gets murdered “for cheap reason”. The killer E.Kyriakopoulos and his friends refuse to state that felt sorry for the assasination. 4/8/2009: A 29 years old woman from Albania comited suicide at the cop station of Hersonisos, Crete because she did not want to be sent back to Albania. 12/7/2008: A 48 year old man from Gorgeen commited suicide in his cell in Kassandreia jailhouse, Thessaloniki because he didn’t want to be sent back to his country.